Welcome To All Cinema Lovers. Today We are talking about List Of Hindi Movies 1992. 1992 was the year when superstar born. It was about “Deewana” Shahrukh Khan. Shahrukh made a fantastic debut with “Deewana”. Interesting Information: “Roja” wons the 2 National Awards which includes Best Music Director – A. R. Rahman and Nargis Dutt Award for Best Feature Film on National Integration. This is among one of the best classic movies of all time. “Roja” is also considered as one of the top 10 tracks by A. R. Rahman. Interesting Information: Movie won two Filmfare awards which include Best Film and Best Editing. The film collected approx. 7.2 Crores at the box office and declared as a hit. The movie is one of the best movies of Aamir Khan’s career. Interesting Information: “Beta” was the 2nd blockbuster movie of Anil Kapoor & Madhuri Dixit pair after “Tezab”. This was the highest grossing Hindi movie of the year 1992. “Beta” wons the 5 Filmfare awards which include Best Actor – Anil Kapoor, Best Actress – Madhuri Dixit, Best Supporting Actress – Aruna Irani, Best Playback Singer Female – Anuradha Paudwal for Dhak Dhak, Best Choreography – Saroj Khan for Dhak Dhak. The film collected 13 Cr. at the box office and became the blockbuster movie of the year 1992. Interesting Information: “Deewana” was the debut movie of Shah Rukh Khan and second highest grossing movie of the year 1992. The film won the 5 Filmfare awards which include Best Debut – Shah Rukh Khan, Lux New Face of the Year – Divya Bharati, Best Music – Nadeem-Shravan, Best Lyrics – Sameer for Teri Umeed, Best Playback Singer Male – Kumar Sanu for Sochenge Tumhain. The movie collected 7.75 Cr. at the box office and emerged as a super hit movie of the year 1992. 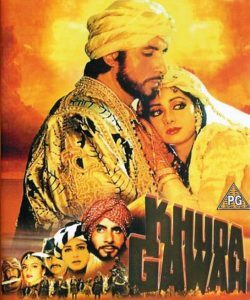 Interesting Information: “Khuda Gawah” was the longest-running Bollywood movie in Kabul, Afganistan. The film won the 3 Filmfare awards including Best Director – Mukul S. Anand, Best Supporting Actor – Danny Denzongpa and Best Sound. The movie collected approx. 6.70 Cr. at the box office and became a 3rd highest grossing movie of the year 1992. “Khuda Gawah” declared as a super hit. 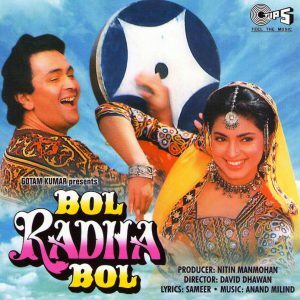 Interesting Information: This was the second hit movie of the Rishi Kapoor in the year 1992. Rishi Kapoor appeared in the double role. The movie earned approx. 4.70 Cr at the box office and declared as a hit. Juhi Chawla received a nomination for the Filmfare Best Actress. Interesting Information: Have you heard the song “Saat Samundar Paar” in discos? 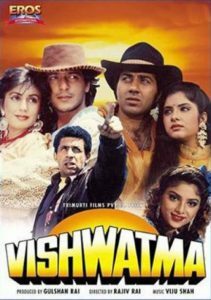 That famous song is from the 1992 released movie “Vishwatma”. This multi-star cast movie emerged as a semi hit and collected approx. 5.40 Cr at the box office. Late actress Divya Bharati became a superstar after this famous song. Interesting Information: This was another super hit movie of Divya Bharati after “Deewana”. The movie collected huge 6.7 Cr. approx. at the box office. This is among top 10 super hit movies of Govinda. Interesting Information: This is among the top 10 highest grossing Bollywood movies of the year 1992. Nana Patekar won the Filmfare Best Villain award for his remarkable performance. 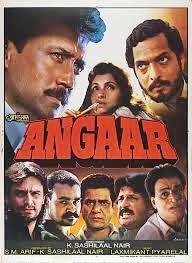 “Angaar” also won the Best Dialogue – Kader Khan and Best Art Direction award. The movie still considered as one of the best “Mafia” based movie. 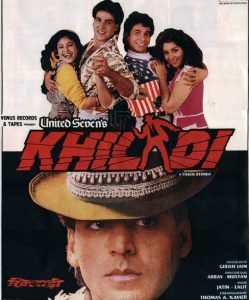 Interesting Information: List of 1992 Bollywood Movies will be incomplete without “Khiladi”.This was the first super hit movie of the Akshay Kumar. The movie became the tenth highest grossing Bollywood film of the year 1992. This is the first movie of the Akshay Kumar’s “Khiladi” series.